This is the view from the Maple Shade, NJ, baseball field complex on December 26, 2011, at 5:46 pm EST. Brilliant Venus is about 7.5 degrees to the left of the two-day old crescent moon, about 12 hours prior to their actual astronomical conjunction in right ascension. This serene setting was captured with a Canon 40D digital SLR camera (on a fixed tripod) and a Sigma 18-50 mm f/2.8 zoom lens at 18 mm focal length. Exposed 2 seconds at f/4, ISO 400, auto color balance; besides size reduction, no post processing applied. Mouseover to see the view at 5:44 pm using the same cameras, lens and exposure, but 50 mm focal length. The image below was captured at 5:30 pm EST with the 40D camera, but using a Canon 70-200 mm f/2.8L zoom lens (on a fixed tripod) set to 100 mm focal length. Exposed 1.6 seconds at f/5.6, ISO 400, auto color balance; again, besides size reduction, no processing applied. The moon was just below the western tip of the "bikini bottom" stick figure of Capricornus. 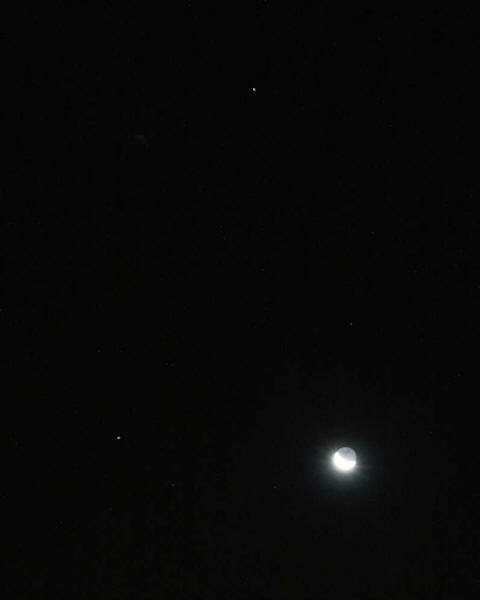 Almost directly above the moon is Dabih (Beta Capricorni) and above-right of that is the naked-eye double star, Algedi (Alpha 1 & 2 Capricorni, right and left respectively). Above-left of Algedi is Alshat (Nu Capricorni). Between the moon and Venus is a compact triangle of Rho, Pi and Omicron Capricorni. Above-right of Venus is Upsilon Capricorni. Click the image for a larger version. 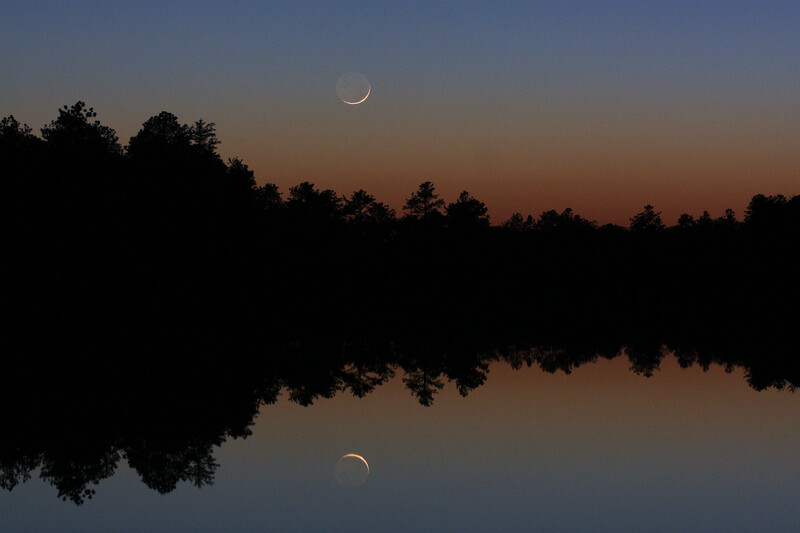 Fifty-five minutes after sunset on December 25, 2011, the young moon hovered over the tree tops along the southern shore of Atsion Lake in Wharton State Forest, NJ, and reflected off its placid waters. New moon was on Christmas Eve at 1:06 pm EST, so the thin crescent (with earthshine) was just 28 hr 29 min old when this image was captured at 5:35 pm EST on Christmas Day. Taken with a Canon 40D digital SLR camera and a Canon 70-200 mm f/2.8L zoom lens (on a fixed tripod) set to 100 mm focal length. Exposed 1.3 seconds at f/5.6, ISO 400. Color and brightness adjusted with Corel Paint Shop Pro X2. Mercury has a reputation for being a very difficult object. The conclusion I draw from this exercise is that with just a little planning and effort, Mercury is not really that hard to find and see. Here's a picture of Mercury (along with stars Graffias and Dschubba in the head of Scorpius) taken at 6:16 am EST on December 13, 2011, from the Pennsauken Mart site. Canon 40D camera and a Canon 70-200 mm f/2.8L zoom lens (on a fixed tripod) at 140 mm focal length (cropped to 72%); 1/2 second at f/4, ISO 800. Mouseover for labels. Damage caused by the heavy rains from Hurricane Irene closed Rt 542 at the bridge over the Mullica River leading to Batsto Village (the frequent home of the Willingboro Astronomical Society's Public Star Watches). On November 18, 2011, I took a trip to the area to see the damage firsthand and take some pictures. As of December 17, 2011, the Batsto office reports that bridge repair will begin in January 2012 and Rt 542 should re-open in February 2012. Click here for more pictures. As of March 15, 2012, both bridges have been repaired, the road is open and the detour is gone. On November 8, 2011, the 400 meter minor planet (asteroid) 2005 YU55 will whiz past the earth at a distance closer than the moon, with the closest approach at 6:28 pm EST, approximately the end of astronomical twilight for observers at a nominal location of 40 deg N, 75 deg W. See the article at Sky & Telescope for more details. Here's a SkyTools 3 chart of the path as seen from 40N-75W that is centered at 9:00 pm EST with a track of ±3 hours. Click for a full-size PDF version (about 100 KB). Update, November 9, 2011: I was able to successfully observe this asteroid last night (November 8th) at Coyle Field in New Jersey. It was spotted at six points along the track between 7:22 and 9:32 pm EST. Movement was readily evident at 160x in my 12.5-inch Dobsonian telescope. It was lost five times because of the movement, fluctuations in brightness (dimming out at times) and because of sharing the eyepiece view. On November 6, 2011, the interior planets Venus and Mercury were just 2 degrees apart in the evening twilight, 33 minutes after sunset, when this picture was taken at 5:25 pm EST from Maple Shade, NJ. The camera was a Canon 40D digital SLR with a Canon 70-200 mm f/2.8L zoom lens (on a fixed tripod) at 200 mm focal length. It was manually exposed 1/20 second at f/4, ISO 400, 4000 K color balance. Venus, at magnitude -3.9, is self evident above-right of center. Mercury, at magnitude -0.3 (27.5x dimmer than Venus) is at the 7 o'clock position from Venus, just above the tree tops (move your mouse cursor over the image to see identifying labels). Mercury will remain about 2 degrees from Venus until November 14th when it reaches greatest eastern elongation and begins heading back towards the sun and inferior conjunction on December 4th. Because of the low slant of the ecliptic along the western horizon after sunset this time of the year, Mercury will not attain much altitude during this elongation. Venus will continue to slowly gain altitude as it heads towards greatest eastern elongation on March 27, 2012, then it will head back towards the sun and inferior conjunction on June 6, 2012, 1:09 UT (June 5, 9:09 pm EST), which will be the Transit of Venus (greatest transit at 1:30 UT, 9:30 EDT), the last such transit until December 11, 2117. On November 3, 2011, I was walking home from the Post Office here in Maple Shade, NJ, when I saw this nice sundog to the left of the sun... one of the more intense and colorful ones I've seen. I grabbed my camera as soon as I got home and took some snapshots; here are a couple of them (move your mouse cursor over the picture to see the other one). They were taken with a Canon 40D digital SLR camera (handheld) and a Sigma 18-50 mm f/2.8 zoom lens. The camera was set to automatic exposure (with a -1.3 stop bias) and automatic color balance, ISO 400. No processing applied besides size reduction. The first picture was taken at 4:57 pm EDT; exposed 1/1250 sec at f/18, 35 mm focal length. The mouseover picture was taken at 4:56 pm EDT; exposed 1/1000 sec at f/16, 33 mm focal length. The sun's altitude at the time was about 9.5 degrees. After finishing with the 'dogs, Zeke the local cat was on the porch. On October 28, 2011, I was back up at the Pennsauken Mart site before sunrise. In addition to spotting Saturn again as I did on October 25th, I wanted to capture a convincing picture of it. In the pictures taken on the 25th with a short zoom lens at 50 mm, some spots were found at the appropriate place, but they were pretty vague. This morning, I went back with the Canon 40D camera, but with a Canon 70-200 mm f/2.8L zoom lens set to 200 mm (the lens was mounted on a fixed tripod). Saturn is now readily evident above the utility pole on the left side of the frame. This image was captured at 6:33 am EDT, 15 minutes after Saturn rose, 51 minutes before sunrise and 15 days after solar conjunction. It's at a nominal 2.5° altitude and 13° solar elongation. Exposed 1/5 second at f/4.0, ISO 800, 4000 K color balance, and cropped to two-thirds of its original dimensions (effectively, a 1.5x magnification or 300 mm focal length). At 6:24 am EDT, 33 minutes after it rose on October 25, 2011, the 28.0-day-old crescent moon, 33.5 hours before new, floats 5 degrees above the eastern horizon as it weaves its way through a veritable forest of utility poles, towers and wires around the site of the demolished Pennsauken Mart. However, they actually make great reference points when looking for celestial objects rising just before the sun. For example, Saturn was spotted at 6:38 am (10 minutes after it rose and 43 minutes before sunrise) near the telephone pole just to the left of the base of the twin latticework towers. Saturn was in conjunction with the sun on October 13th (12 days ago) and had a solar elongation of just 10.3 degrees when spotted with 16x70 binoculars. This picture was taken with a Canon 40D digital SLR camera (on a fixed tripod) using a Sigma 18-50 mm f/2.8 zoom lens set to 50 mm focal length. It was exposed 2 seconds at f/4.0, ISO 800 and with color balance set to 4000 K. Porrima (Gamma Virginis) is the star above-left of the latticework towers. This is the view at 6:14 am EDT (about an hour before sunrise) on October 23, 2011, looking east along the railroad tracks at the end of my block in Maple Shade, NJ. Besides the general light pollution from being close to Philadelphia, local light pollution is also significant — in particular, notice the senior citizen complex which is surrounded by bright acorn lights that gush light in every direction (one wonders how they get any sleep with all that glare). In contrast, new streetlights were recently installed in the neighborhood; they have a high-powered fluorescent bulb in a flat fixture that points down (an example is at the bottom-right). A natural source is the 26-day-old crescent moon in the upper-right-hand corner of the frame. Taken with a Canon 40D digital SLR camera (on a fixed tripod) and a Sigma 18-50 mm f/2.8 zoom lens set to 18 mm focal length. Exposed 1/2 second at f/4.0, ISO 800, monochrome mode. On the morning of October 22, 2011, there was an attractive grouping of objects in the western end of Leo the Lion. The 25-day-old crescent moon (26% illuminated) was 10 degrees below Mars (at the top of the picture, magnitude 1.2) and 6 degrees to the right of Regulus (Alpha Leonis, magnitude 1.4) as viewed high in the east during the early stages of morning twilight. Somewhat fainter Subra (Omicron Leonis, magnitude 3.5) is 4 degrees above the moon. This image was captured at 5:58 am EDT from Maple Shade, NJ, using a Canon 40D digital SLR camera on a fixed tripod and a Sigma 18-50 mm f/2.8 zoom lens at 50 mm focal length; exposed 0.6 second at f/3.5, ISO 1600. Move your mouse cursor over the image for a clip of the setting from SkyTools 3 interactive atlas. The blue diagonal line is the ecliptic, the other lines are constellation boundaries (Cancer to the upper right, Sextans to the lower right and a tiny corner of Hydra above Sextans). Besides the cropping noted above, I also used Corel Paint Shop Pro X2 to "erase" the background building under the beast's chin. 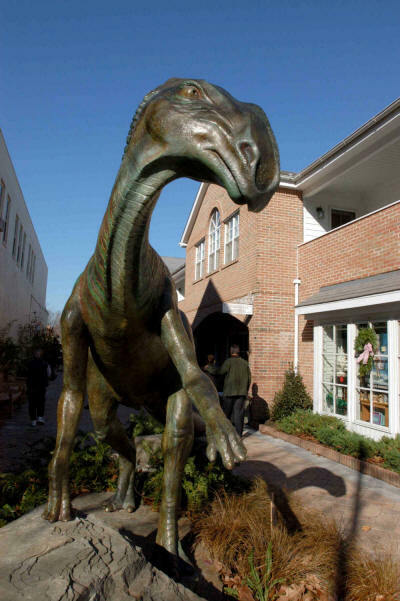 This bronze statue represents Hadrosaurous Foulkii, the bones of which were discovered in Haddonfield, NJ, in 1858. 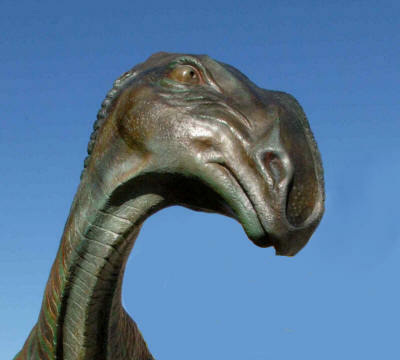 It was the first more-or-less complete dinosaur skeleton ever found. 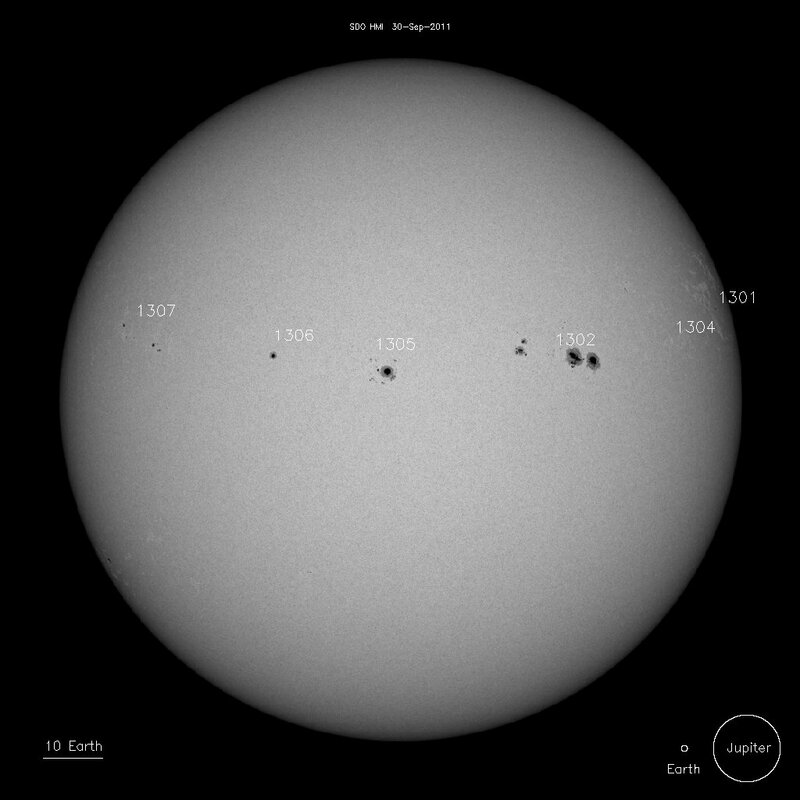 The bones now reside in the Academy of Natural Sciences, Philadelphia, PA.
On September 30, 2011, a string of sunspots stretched across the solar disc when this image was captured at 10:26 am EDT from Maple Shade, NJ. From the upper right to the lower left, the groups are 1302 (which includes the two largest spots and the two smaller spots below-left of them), 1305, 1306 and barely visible near the limb at the 7 o'clock position, 1307 (click the image for a larger version to better see them). 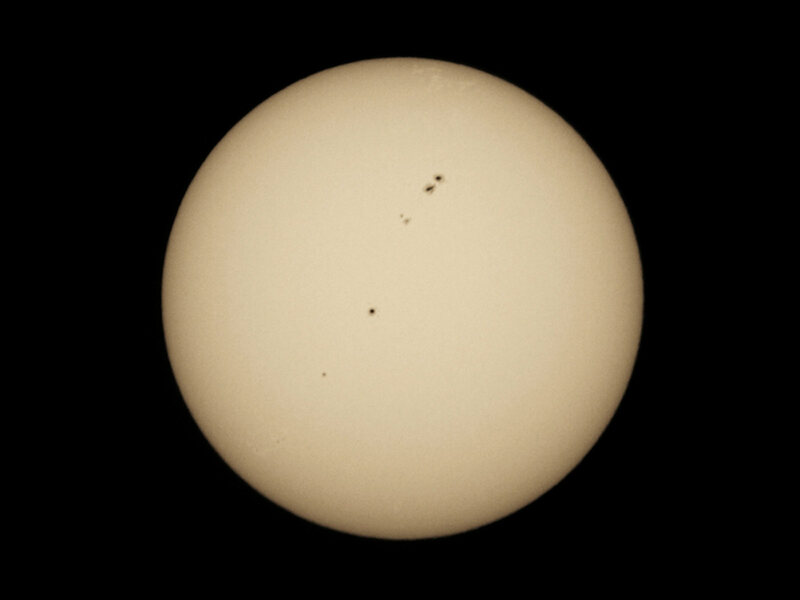 Taken with a Canon 40D digital SLR camera through a William Optics 80 mm f/6 apochromatic refractor with an Orion metallized glass filter in front of the objective and a Kendrix doubler on the camera for an effective focal length of 960 mm at f/12. This single frame was exposed 1/1000 second at ISO 800 using the monochrome setting. The image was cropped, some mild adjustments were made to the brightness and contrast and a touch of yellow color was added using Windows Photo Gallery. On July 27, 2011, Venus rose at 5:25 am EDT and the sun rose 29 minutes later, at 5:54 am (for a nominal location of 40 degrees north and 75 degrees west). I made a short trip to the site of the now-demolished Pennsauken Mart, which provides a wide vista towards a very low eastern horizon (it's about 1.8 miles from 40°N-75°W). On arrival at 5:48 am, Venus was spotted immediately with 10x42 binoculars, even though it was only 3.5 degrees altitude with a solar elongation of 5.5 degrees (Venus will be at superior conjunction on August 16, 2011). When this picture was taken at 5:59 am, the sun was emerging from the distant tree tops at 65 degrees azimuth and an apparent altitude of 41 arc-minutes (so the upper edge of the sun is about 1 degree high). By then, Venus was near 5.5 degrees altitude (it was approximately twice the height of the tower immediately to the right of the sun, and slightly to the right of it). However, Venus is not visible in this picture and after taking it, I could no longer find Venus in the binoculars as the sun became increasingly brilliant. Taken with a Canon 40D digital SLR camera and a Sigma 18-50 mm f/2.8 zoom lens set to 50 mm (mild telephoto for the APS-C size sensor). Exposed 1/500 second at f/10, ISO 400, auto white balance. Update, August 5, 2011: Venus was observed with 16x70 binoculars at 6:00 am EDT, 2 minutes before sunrise with a 3.25° solar elongation. At 6:07 am, Venus was still visible in the 16x70s as the sun breeched the distant tree line. Because of its low altitude, and cloudiness that was hugging the horizon, the emerging sun was a deep orange color. At 6:08 am, with half the sun out of the trees and Venus still visible above the cloud line, I was able to move the binoculars down a little and see Venus and the sun simultaneously in the 4 degree field of view. Note that viewing the sun without an appropriate filter would be dangerous in virtually all circumstances, but the brief combination of extremely low solar altitude plus cloudiness allowed this rare and remarkable sighting. A final sighting of Venus before superior conjunction was made on the morning of August 10 at 6:10 am. However, at a solar elongation of 2°, it had become difficult to see Venus with the 16x70s. On August 12, under a very clear and transparent sky, I was unable to find Venus with an 80 mm refractor at 20x (1.7° elongation). Using the 16x70 binoculars at mid-afternoon on the day of superior conjunction, August 16, Venus could not be found due to persistent passing clouds. Shortly before noon on August 17, swarms of wind-blown pappi a couple hundred feet high peppered the sky near the sun with white specks that foiled my attempts to find Venus, even though the sky itself was quite clear and blue. On the latter two dates, my house was used to block the sun while searching. August 30 was a splendidly clear day after Hurricane Irene cleared out, and despite the pappi again, I was able to spot Venus with 16x70 binoculars at 1:05 pm EDT (using the house as a sunblock!). Later that day, Venus was observed with the 16x70s just after sunset (7:33 pm EDT) at Coyle Field when the solar elongation was about 4.25 degrees (but the ecliptic was at a considerably more shallow angle in the evening than it was in the previous morning sessions). 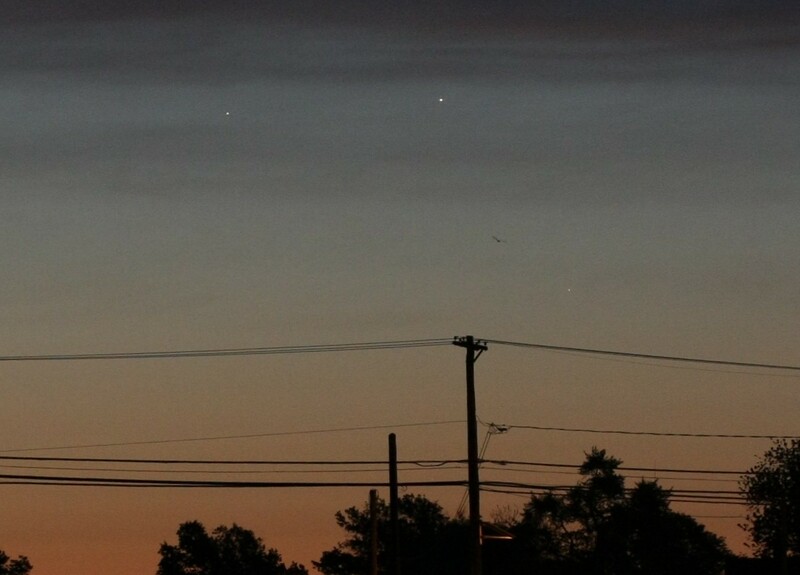 On May 11, 2011, Jupiter (upper left) and Venus (lower right) were only half a degree apart, at about 2 degrees altitude, when this image was captured at 5:02 am EDT from the railroad tracks in Maple Shade, NJ. Mercury is about 1.5 degrees to the lower right of Venus (in a nearly straight line from Jupiter), but it is still hidden by the trees, not to mention the dense atmosphere at 1 degree altitude. Mars is slightly lower behind the trees about 6 degrees to the left of Mercury, but both of these dimmer planets were later seen in binoculars at a higher altitude. The image was captured with a Canon 40D digital SLR Camera and a Canon 70-200 mm f/2.8L zoom lens set to 70 mm focal length. Exposed 1/2 second at f/5.6, ISO 800; auto white balance. Click the image for a larger version. 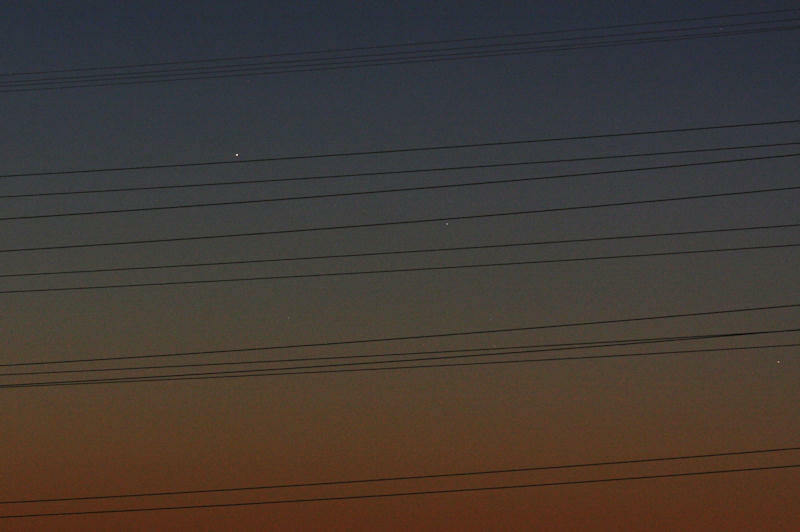 On May 10, 2011, the planets Venus, Jupiter and Mercury were clustered together in the morning twilight before sunrise. In the image below, taken at 5:13 am EDT from Maple Shade, NJ, bright Venus (magnitude -3.9) appears above the utility pole near the center. Click the image for a crop of the center showing Jupiter (magnitude -2.1), which is 1.3° to the left of Venus, and Mercury (magnitude +0.4), which is 1.5° to the lower-right of Venus (and below-right of a passing bird). Mars was about 6.5° to the left of Mercury, but at magnitude +1.3, was too dim to show in the brightening twilight (and it was not seen in binoculars either). Taken with a Canon 40D digital SLR camera and a Canon 70-200 mm f/2.8L zoom lens (on a fixed tripod) at 85 mm focal length. Exposed 1/10 second at f/5.6, ISO 800, auto white balance. The view is roughly east (the railroad tracks run towards an 82° azimuth). At the time the picture was taken, Venus was about 4° altitude (so the trees below it are around 1.5° high).